Ghastly ghouls, horrific monsters, and vile flesh-eating creatures roam the earth this night of Halloween, but none evince the evil that has of late entered the halls of ILSR. One of our own has faced the torture of an entity bent on pushing him over the precipice of human endurance, twisting his psyche with the torment of nonsense, and claiming his head for their own. On past Halloweens we’ve written fun, spooky content about scary telecom monsters and frightening tricks; this year we relay the haunting, dramatic tale of John Farrell and The Legend of CenturyLink Hell. Unlike Icabod Crane of gothic New England lore, John's head has stayed firmly attached at the neck, but recent encounters with the office Internet service provider have lead him to that dark place where so many others have accidentally strayed - into the no man's land of customer service decapitation. It all began with a new phone for the office. John, newly appointed Co-Director of the Institute for Local Self-Reliance and the head of the Democratic Energy Initiative, had ordered phones from ILSR’s Internet access provider in the past. CenturyLink, which provides VoIP, had provided the physical phones before with no issue, but this time there was no power adapter included in the package. Thinking the oversight would be easily remedied was John's first mistake ... and the first step on his journey into hell. John reached out to the sales associate who he had worked with when ILSR switched from Comcast to CenturyLink’s fiber service. He explained that the new phone ILSR received didn’t include a power adapter and asked them to order one. To John's surprise and dismay, the sales associate told John that they couldn’t order a solo adapter and referred John to the Mac Desk at CenturyLink. He reached out to the sales people at the Mac Desk, but the answer he received was cold comfort that stirred an uneasy feeling in his bowels. The Mac Desk sales team responded curtly. Ordering a solitary power adapter was not an option. It was not available in his admin portal, you see, and they could only place "bundled orders." John's head swimmed. In order to facilitate his request (and push him off on some one else), the Mac Desk copied the email to his sales associate — the same person sent John to the Mac Desk in the first place. Like a man wandering aimlessly in a dark, dangerous forest, John had travelled far and gone nowhere. He had made the first round trip in the loop of never ending CenturyLink insanity. John might have escaped the madness, if he had chosen a different path, but the man's optimism took control of his drive to solve the phone cord dilemma. When the sales associate emailed the team who helped set up the network, John grasped at the possibility that they might be able to help find an adapter for the ILSR phone. Instead, the answer was deafening silence. Weeks of silence. As those who face crippling psychological horror understand, there comes a point when the mind refuses to believe reality because it is so horrid, so gruesome, and so debilitating. Sometimes the consciousness chooses to look away from the facts to avoid descending into madness. Unwilling to accept the nightmare of the CenturyLink situation, John stepped back to regroup. A month later, after recovering his senses and feeling his strength return, he reached out to someone from the original installation team at CenturyLink. He forcefully pointed out that he had never received a reply, that ILSR still needed and wanted an adapter after six weeks without one. He knew he was toying with the devil, but his own sanity demanded he try once last time. John is only one of thousands of people who have endured horrific customer service torture from a gigantic national ISP and his nightmare wasn’t over. Every month, John is faced with a subtle reminder of the incompetence at CenturyLink when he logs into review ILSR’s invoice. Residential subscribers have the option to download their invoice, but business subscribers such as ILSR, must engage in a time consuming, frustrating process to download their invoice for record keeping purposes. It is here, in the firey hell of the billing department, where John suffered yet another abomination. As a Co-Director, one of John’s administrative tasks is to review and approve invoices from CenturyLink and he needs to download PDFs for record-keeping purposes. In order to do so, John cannot immediately download a PDF, he must REQUEST that a PDF be generated for download — a process that takes 20 minutes. According to our embattled hero, the amount of time it takes to send the request through the business portal, wait for the request to be honored and notification sent to the subscriber to let them know a PDF is ready for download is just about the same amount of time it takes for the portal to automatically log him out of the system. Every month, John must endure this multi-step process to get a copy of the ILSR invoice. When he was finally pushed to the limit (around the same time as he faced the CenturyLink phone adapter insanity maze), John finally complained in his logical, patient manner. He was told by a sales associate that ILSR could be switched back to a paper invoice, but that CenturyLink is in the process of becoming an entirely paperless company, so the change would be temporary. John asked us to omit the sales associates name. "I don't want them to be punished for being honest," he said. As all good fables, The Legend of CenturyLink Hell offers a lesson, unites us in common experience, and confirms our ideas of good versus evil. With so many subscribers choosing large national ISPs as the most hated companies in America, the common experience and interpretations of good and evil intertwine. With little or no choice of Internet access provider due to the fact that ISPs such as CenturyLink, Comcast, and AT&T have created a monopolistic lock on most of the country, our hero's lesson is a lecture he's trapped in for all eternity as long as ISPs have no reason to better serve subscribers such as ILSR. 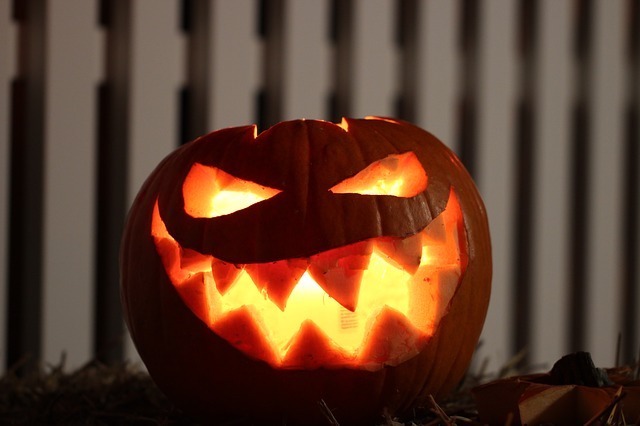 Image of the jack o' lantern courtesy of darf_nicht_mehr_hochladen via pixaby. Your Choice: Cable Monopoly Tricks or Muni Fiber Treats?